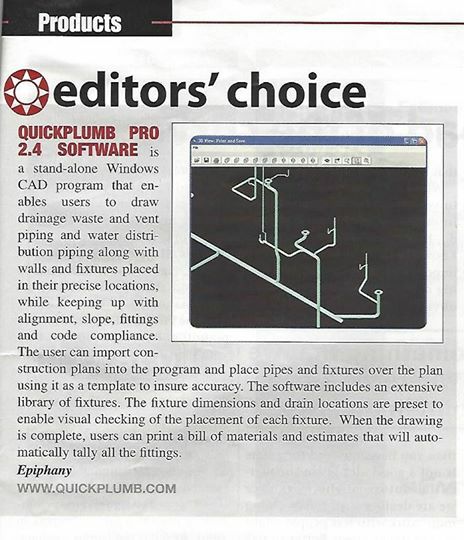 QuickPlumb by Epiphany Software Corporation makes “Editors Choice” in Contractor Magazine! Thank you guys and girls at Contractor! You are the best! There is no easier plumbing software on the market. With it’s ability to count each and every fitting so that you know the correct material quantities will be ordered and you will not be caught short of supplies the cost on the software will more than pay for itself. Think of how devastating it is when you arrive on the job site after the concrete has been poured only to find that there was an error. The plumbing stub-ups are in the wrong location!